Today Sam is building workbenches in his shop. Not one to waste any time, is he? :) Henry was dying to "help" in his own unique way, so I went to my gift shelf and pulled out a little kids tool set that's been in there for a while. I thought that he would love to use his own real hammer in his daddy's shop. 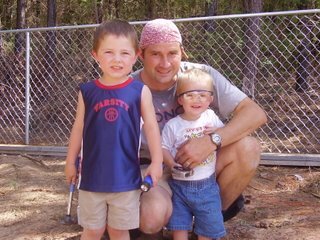 After dividing up the tools (Henry got the hammer and the flashlight, Jonah got the tape measure and the safety glasses), we headed out to the shop. Unfortunately, before I even got Jonah through the door, Henry was retreating. Sam had started the saw, and Henry hates the noise. In the process of the retreat, he tripped and scraped up his knee. It didn't hurt until he saw the blood. Then it definitely needed a band-aid and maybe some lemonade to make him feel better. We were heading to the house to doctor him up, when Henry almost walked into a spider who was hanging from a web just outside the back door (it was just above his head). Trauma! We finally made it to the house, only to have the boys get confused over which tool belongs to whom. After trying to mediate, I made the decision that nobody needed to have tools in the house. Jonah didn't really care, he went and grabbed a book off the bookshelf. Henry, on the other hand, burst into tears. Absolutely inconsolable. I was starting to wonder if we were going to survive this day. In the midst of all of this, my wonderful husband offered to take me out to dinner tonight. He didn't even know what was going on, but he always seems to know the right thing to do! I am clueless as to how he does it . . . especially since I know he is working long hours at TM too! I thought for sure that Henry would have traded in the toy tools for the real ones the moment he got in to the shop. The shop...your husband is amazing. And to think that he has been holding down a more than full time job, providing for the family in many other ways, and helping out he parents to boot! You are both amazing and we love you so much!